This fall, as the leaves change color and the record-breaking heat and humidity are a thing of the past, parents begin carting back and forth to synagogue for bar or bat mitzvah lessons. Many of these Philadelphia-area families are preparing their soon-to-be 13-year-old children for their bar/bat mitzvah. While four to eight months seems like a lifetime away, these young adults will reach this important Jewish milestone. Before the big day, students will practice prayers, Torah and Haftorah portions, write their D’var Torah speech and select a mitzvah project. Mitzvah projects are becoming very creative and individually tailored, as more resources online are available. One local resource is The Mitzvah Bowl, which targets teens/parents that are searching for a meaningful mitzvah project. The website allows families to search hundreds of mitzvah project ideas that are easily organized by interest. Zac really wanted to have something to do with sports for his mitzvah project. Last summer, I was trolling the web for ideas when I came across your website. I saw info on PeacePlayers and the baseball collection drive and showed them to Zac. He checked out the information and really liked what PeacePlayers stood for. He loved the idea of running a 3-on-3 basketball tournament with his friends. He wanted to make sure that his project was going to be fun for him to do. 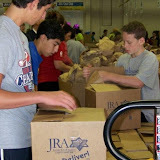 We are confident our website has helped hundreds of area bar/bat mitzvah students since its inception in May 2010. Recently, Alex Smith, a May, 2012 bar mitzvah student, contacted us seeking advice on how to find a mitzvah project. He was interested in working with kids, but was very busy during the school week with school and sports. The Mitzvah Bowl suggested contacting Friendship Circle, a local organization where children and teens with special needs are teamed up with a teen volunteer to enjoy many of the social and recreational opportunities afforded to the community at large. Alex is excited to start his project. What Cheryl and Val have done in creating The Mitzvah Bowl is not just a mitzvah in itself, it is an invaluable labor of love that will generate countless mitzvot over the years. The Mitzvah Bowl demonstrates so clearly that the work of Tikkun Olam (Repair of the World) starts with finding just one small space to repair and the good works flow exponentially from that first step. I am deeply indebted to them for their coordination, vision and labor in bringing The Mitzvah Bowl to the table! If you are a parent of a bar/bat mitzvah student, don’t look any further than The Mitzvah Bowl – your guide to finding the ideal mitzvah project. Charitable organizations can be listed on the website by contacting us at [email protected].